When the CrackBerry team recorded its latest podcast this week we spent quite a bit of time talking about the awkward position that RIM is in. When tech companies go through major transitions, we see a lot of negative headlines. This has happened to every single major technology company that has ever lost market share during a major market shift. But, of course, not all of these companies die, or are broken up, or whatever. Some actually go on to recreate excellence. There's no better example of this than Apple. By their nature, financial news is reflective of the past. This includes quarterly reports, layoffs, inventory write downs, and you can extend it to non-financial stuff like market share data. This means that whenever we see a headline about RIM that is negative, pertaining to financials or market share, it will ALWAYS be negative so long as the company is still going through its transition. On the flip-side of news that looks backwards, we have everything else that looks forwards. You can't exactly call this "news" because it's not based on fact. It's based on opinion, extrapolation, analysis, expert discussions, and so forth. People who are looking at a company like Research In Motion and analyzing the future can't get caught up too much in the past. The past does not help you understand the future except to get a handle on how the company got into its sticky situation. But with RIM, that's pretty obvious. No point in beating a dead horse. Question is ... where is RIM heading from here? The point of this article is really just to encourage all of you to begin to notice what kind of stories you're reading. 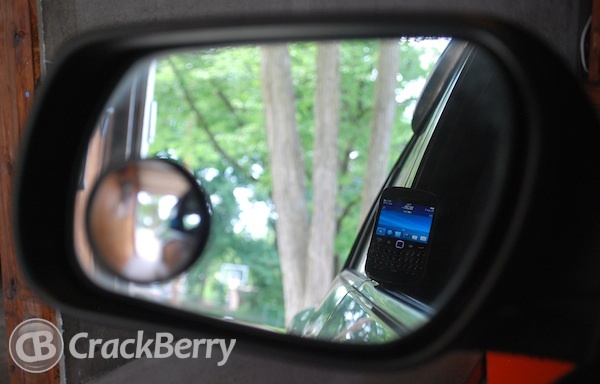 Are you reading something that tells the story from the perspective of the rear view mirror? If so, it's not very useful. Finally, I'll point out that there is realistic analysis and there are beer googles. Obviously when you look at the collective views of people on a fan site such as CrackBerry, you're more at risk of sporting a powerful pair of reality-distorting beer goggles. In my opinion, the best way to avoid this is to completely forget about your own, personal views about a product. BlackBerry (or any tech product) is not made for YOU specifically (or me). Products are made for a large audience who, on average, may or may not share your specific opinions, tastes, and values. So forget about what you think, personally. Focus on what you observe out there in the real market. Look forward and analyze what is actually happening rather than dwelling on what has already transpired. And the next time you read about financial news, say to yourself, "Ok, so that's what happened in the past. What does it mean to the future?"